Açıkbaş, S. (2008). Çok Hatlı Çok Araçlı Raylı Sistemlerde Enerji Tasarrufuna Yönelik Sürüş Kontrolü, Doktara Tezi, İTÜ Fen Bilimleri Enstitüsü, İstanbul. Pang, Y. ve Xu, Y. (2016) “Analysis and treatment of harmonic in power network with railway based on ETAP software”, Power and Engineering Conference, 25-28 October 2016, China. Saber, A. (2015) “Power system stabilizer tuning using swarm based optimization in ETAP”, IEEE International Conference on Power Electronic, 16-19 December 2014, Mumbai. Afifi, S., Wang, H., Taylor, G. ve Irving, M. (2014) “Impact of DFIG wind turbines on short circuit levels in distribution networks using ETAP”, UPEC Power Engineering Conference, 2-5 September 2013, Dublin. "Environmental Guidline for the procurement of new rolling stock, outcome of the UIC project", PROSPE R, Henning Schwatz, DB AG. IEA and UIC, "Railway handbook 2012 – energy consumption CO2 emissions", International Energy Agency;2012.http://www.uic.org/IMG/pdf/ieauic_energy_consumption_and_co2_emission_of_world_railway_sector.pdf. European Commission, "Roadmap to a single European transport area – towards a competitive and resource efficienttransportsystem";2011.http://eurlex.europa.eu/LexUriServ/LexUriServ.do?uri=COM:2011:0144:FIN:en:PDF. Official Journal of the European Union, Decision No 406/2009/EC on the effort of Member States to reduce their greenhouse gas emissions to meet the Community’s greenhouse gas emission reduction commitments up to 202;2009.http://eurlex.europa.eu/LexUriServ/LexUriServ.do?uri=OJ:L:2009:140:0136:0148:EN:PDF. European Comission, "A Roadmap for moving to a competitive low carbon economy in 2050" – ref. COM(2011) 112 final; 2011. ISNAD Karakuş, Furkan , YUMURTACI, RECEP . "Raylı Sistemlerde Orta Gerilim Elektrifikasyon Sisteminin Modellenmesi ve Besleme Senaryolarının Belirlenmesi". 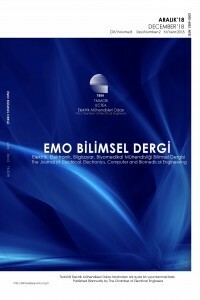 EMO BİLİMSEL DERGİ 8 / 1 (June 2018): 41-48.